The Canadian Journal of Law & Jurisprudence serves as a forum for special and general jurisprudence and legal philosophy. 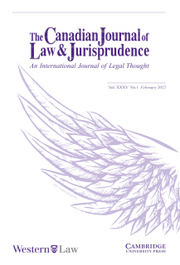 It publishes articles that address the nature of law, that engage in philosophical analysis or criticism of legal doctrine, that examine the form and nature of legal or judicial reasoning, that investigate issues concerning the ethical aspects of legal practice, and that study (from a philosophical perspective) concrete legal issues facing contemporary society. The journal does not use case notes, nor does it publish articles focussing on issues particular to the laws of a single nation. The Canadian Journal of Law & Jurisprudence is published on behalf of the Faculty of Law, Western University. The Coxford Lecture Do Markets Drive Out Traditional Values? Can Human Flourishing Be Liberal?